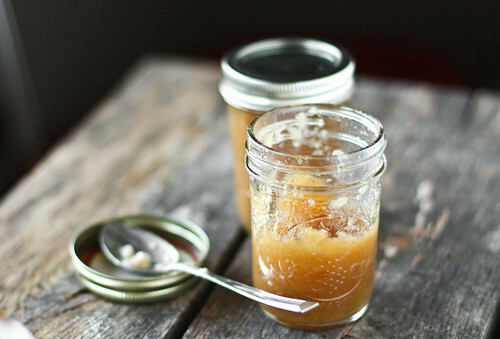 honey & jam | recipes + photos: Homemade Spiced Slow Cooker Applesauce. Homemade Spiced Slow Cooker Applesauce. 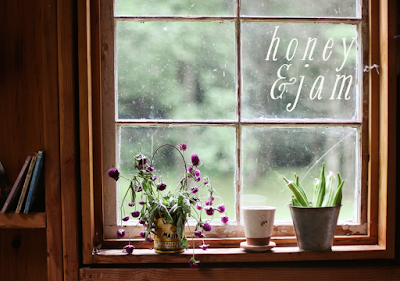 I really should call November breakfast & comfort food month here at honey & jam, shouldn't I? It’s the cool weathers fault! It makes me crave homey deliciousness. Case in point, I’ve been craving homemade applesauce something fierce lately, so when my mom got her early christmas present in the mail, a slow cooker, I jumped at the chance to make a big batch. Finding some giant honeycrisp apples at the grocery store just sealed the deal. Warm, homemade applesauce is so good, y’all. It’s nothing like that overly pureed, tasteless stuff you get at the store. I like mine sweetened with brown sugar and spiced with cinnamon. It’s so simple, easy to do, but it’s so, so tasty and can be used with so much. It’s a perfect topping for ice cream, pork loin, or my favorite, oatmeal. The last time I made applesauce, I just did it on the stove top, but I have to say the slow cooker made it even easier. Here’s the recipe I used, and a link to one done on the stove. Enjoy! 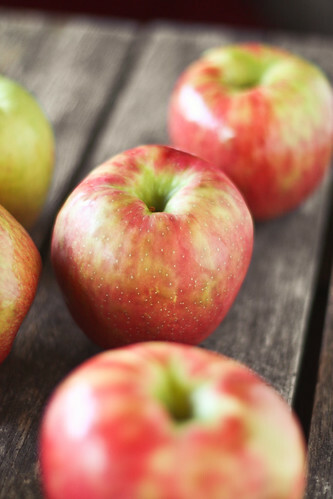 Combine the apples and water in a slow cooker; cook on Low for 4 to 6 hours. Stir in the brown sugar, cinnamon and nutmeg; continue cooking another 30 minutes. Make it on the stove! Hi Hannah! Thanks for linking back to my orchard applesauce. It's pretty darn good. Yours looks awesome too! So glad I found you, what a beautiful blog! Now I'm hooked! Mmmm, that looks wonderful and my youngest loves applesauce. Yum! That sounds so delicious! I love applesauce but have never made it myself for some reason. I will have to give this recipe a try! I am with you on the comfort food I have been eating chicken pot pie and pasta like nobody's business! Oh beautiful! I LOVE applesauce. I had about 10 lbs of apples to deal with and apple sauce and apple butter were just the ticket. Thanks for your inspiration! Mmm, that looks super delish and so easy. Thanks for sharing this! That's lovely! I make apple butter in my slow cooker, but without any added sugar (just apple cider, spices, and apples) since it's ultimately the sweetness and taste of the fruit that I want. It cooks low and slow and comes out perfectly. Love those slow cookers! Aren't slow cookers the greatest? Thanks for sharing this! It looks delicious! Awesome!! I <3 slow cookers! I'm guessing this is a stupid question, but if I made a double batch, do you think it would freeze well in canning jars? I would love to use our surplus of gorgeous fall apples before winter arrives. 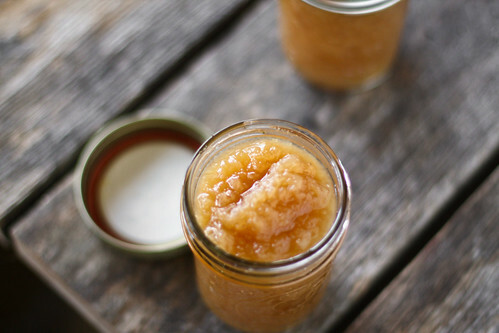 I love homemade apple sauce. (I can't believe I grew up on that stuff in a jar.) Your photos came out beautiful - can almost taste the sauce just by looking at them! And, PS: " . . . something fierce" - My Grandma (and my family) are the only people I've ever heard say this. Love it. oh wow. i don't celebrate thanksgiving, but this makes me wanna!! is this for turkey? or can i spoon some on a muffin? Never would have thought to try this in a slow cooker! UNBELIEVABLE! Your photography is beautiful - can you teach me? Pretty please? Wonderful! I really want to make this! Ohhhh, my! The photographs are beautiful! And, who doesn't love applesauce? (Hmmm, well, actually I know people who don't...) But, I'm pretty sure that they have taste bud issues, etc. 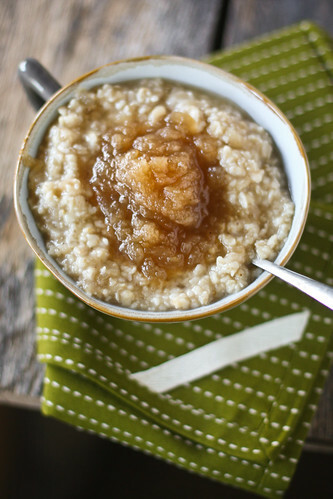 I love applesauce, especially in oatmeal too! Delicious. I had exactly eight Honey Crisp and Stayman Winesap apples in the fruit basket that were past the point of eating -- no longer crispy, bruised, and just unappetizing altogether -- and this recipe was perfect. I'm so glad that I was able to make something DELICIOUS with fruit that I didn't want to throw away but certainly didn't want to eat. Yay! I popped this into the slow cooker before we went out for the evening with friends, stirred in the sugar + spices when we came home, then unplugged the thing and went to bed. This morning I put the applesauce in containers and into the fridge. I'm sure I violated the FDA's guidelines on food safety so please don't tell my husband, who thinks it's yummy too. I've never had applesauce on oatmeal but I am going to try it this time thanks to your appealing photo/suggestion! Looks beautiful! I haven't made any applesauce this year. I'm thinking of making some this weekend! 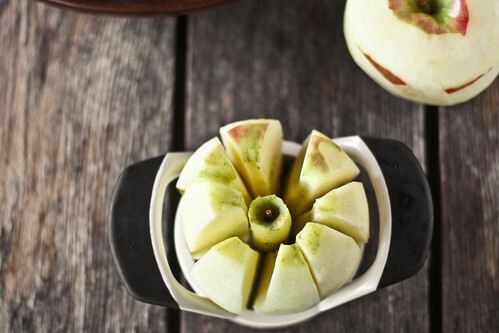 I LOVE making slow cooker applesauce. It makes the house smell fabulous! I only like my applesauce warm. And this one looks delicious! Love applesauce! Fall wouldn't be complete without making a batch of it with apples we've picked ourselves. Mmm. Hello from a fellow Hannah, baker, and photographer, finally coming over to check out your blog after the Thanksgiving busyness. I'm glad I did--beautiful photos; I'm inspired now. And the slowcooker idea for sauce is a good one. I'll have to try that next time. My daughter, Lady Jess, made this for us and it's wonderful! Thank you. what other apples would be good to use? I was wondering that also, what kind of apples are best to use? If you want to can your apple sauce, put it in clean stirel jars and seal with lid and ring, then put n in a container that will let you cover the jars completely , about an inch of water over the top of the jars ,bring to a boil, simmer in the jars ten minutes, this makes the jars seal, will keep on the shelf.This is called "water bath"